Not sure whether it's appropriate to post this on 1Spot, if not I will remove it. 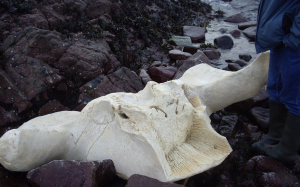 These bones are from female Fin Whale washed up on a local beach. Samples and most of the bones were recovered and taken away by research groups for analysis. These photo were taken when we visited the site about two week after if was found.